I commented on Bhagpuss’s latest post about how I largely agree that loot boxes are a fun mechanic. This was in the context for me that it is a method of advancement and not the sole one. The example I used in Fortnite that it is basically the *only* way you can progress meaningfully so when that is gated behind a hard paywall it is frustrating and not fun. This has caused me to stop logging in execept for the idle game portion – I collect research points per hour and they max out, so I find myself logging in, collecting them, spending them, and logging out. All without really playing. Not sure how long this will go on. They either need to grant a Llama after every cooperative round (LLama is their loot box/pinata) or greatly increase the quality of the items found within it. It is still in early access so I may revisit it once/if they announce changes. In my last post I complained a bit about Paladins but found myself in a shooter mood last night and time to spare so decided to log in and see how things are. They added another new champion, Strix, who is a sniper with stealth. I am going to pause there, to let that sink in. Just for people who have ever played games that had a stealth mechanic and how unfun and difficult to balance that is. This is still about lootboxes. Paladins is also loot-box based but you can buy everything with two three types of currencies – gold, essence, and crystals. Crystals are mostly cash only (you get 50 a week for logging in 7 days in a row) and crystals are mostly used for skins and cosmetic items, so it’s not bad. I can get behind this kind of loot box. All the important things in games (champions, cards, etc) are available through gameplay – and not even that hard. A purely F2P player can literally play the entire game and unlock everything without a ton of effort. Playing a hour a day, you would unlock a champion at the rate of one per week quite easily. It would take you far longer to master that champion. I paid $20 for the founders pack which gives you every existing champion AND all future ones (plus a bunch of lootboxes for ability cards and customization outfits, etc.) It was a great investment as I have already racked up over 100 hours in the game, and even bought crystals ($35) to get some skins I like. The tough part about their skins is that you don’t buy them directly, you still buy a loot box for a chance to get the skin. These are pretty limited (ie: hold 16 different items) and you can’t get duplicates in special chests. (Duplicates on common, Radiant chests). The challenge here is that you have a min/max on spend, based on chance. When you know you want ONE particular thing it would be better to know that cost and make that decision. In those chests might be many different things that you aren’t interested in. I now play 4 Champions regularly. Lex (Flank), Ruckus (Tank), Inara (Tank) and Ying (Heals). Recently Inara got a skin, which I bought crystals for, and which I ended up getting half way through the chest items (8/16) and it cost me around $9. If I would have received it on the first it would have been $1. That is a big range. I wasn’t stoked with it completely. Then, Lex got a shiny new skin. And not fair in the sense that I had bad luck, but there is no governing body to ensure that video game loot mechanics are based off of real randomization or chance. In fact, there is nothing, anywhere stating that you have an equal chance to get any item in that box. They should be 1/16 but a smart company, not required to disclose, would make the lesser, not as cool items (of which there are many in each chest) have a 4/16 chance of dropping. Sure, the chances get better as the person unlocks the items but it could drive more crystal use and hence more revenues to head office. There is no reason to suspect this isn’t happening, and no recourse or need for the company to provide drop rates. Unless you live in China, and are selling to Chinese customers. How do the Communists get this more right than the west? To prove my point further, I didn’t get the two best skins until the last two chests. 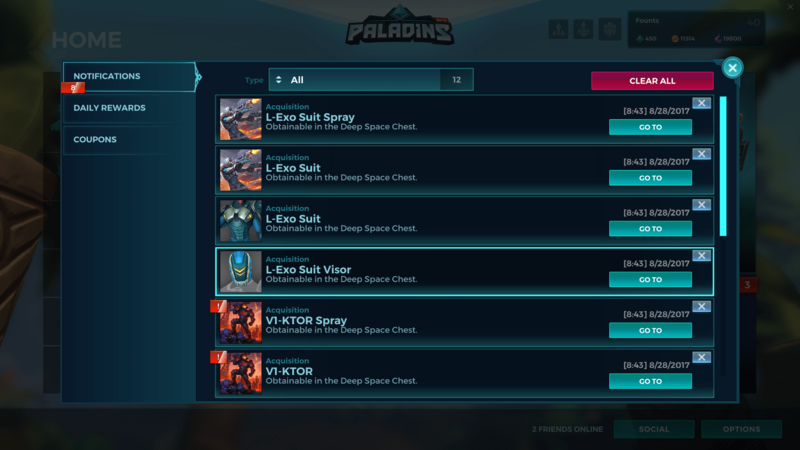 The V1-KTOR and L-Exo suit were the two new skins in this patch and chest. What are the chances that they drop 15th and 16th in a pure, random environment? Not sure. I believe loot boxes need to be upfront, honest, and regulated, so people can make fair purchase decisions.